Boats waiting at Lynyard Cay to head out to their next destination. On December 23 we sailed from Marsh Harbor to Lynyard Cay where we spent the night before our jump to Eleuthera. 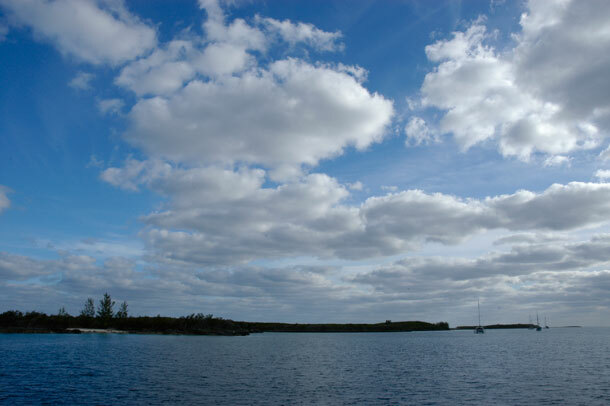 Lynyard Cay is the southern most inlet to the Sea of Abaco and is a popular anchorage for boats arriving and leaving the area. On Christmas Eve we rose early and followed three other boats out the cut just as the sun was thinking about showing itâ€™s shiny self to the Bahamas once again. The 58-mile trip through the Atlantic Ocean to Eleuthera went well, but of course, as usual, it wasnâ€™t perfect. But in the end the good out weighed the bad and the bad was dealt with successfully. Perhaps the best thing about the trip was that I didnâ€™t get sick. This is good news, not only because I didnâ€™t have to spend the whole day either throwing up or horizontal, but because it means that Greg and I can share helming responsibilities which means we can make longer journeys in rougher water. We suspect that the medicine didnâ€™t work on the journey across the Gulf Stream because I didnâ€™t take the initial dose early enough before the start of the trip. This time we set an alarm for 4:00 am so I could get the pills working in my system in the prescribed amount of time before our departure. The day was beautiful. Good weather smiled down on us. Greg had been keeping an eye on the atmospheric situation for weeks, looking for the best weather window to make the jump. It paid off. The sky was clear, the wind was steady out of the southeast, and the waves were relatively calm. On top of no sickness and good weather, we made the whole journey in the daylight, arriving at our destination just before sunset. We averaged seven plus knots. Heeled over, water constantly streamed over our starboard rail. This was the fastest we have sailed Blue Wing, except when we were being pushed along by the Gulf Stream last spring when we were returning to Florida. The new improved speed might be due to our increasingly superior sailing skills, but I think it is more likely due to the new sail. Which ever it is, it is another big plus enabling us to go longer distances in one hop. About five hours in to our trip the carbon monoxide alarm went off. There was no real reason for this since we werenâ€™t running the engine, and even if it were, there was no immediate danger to us since we were outside. It was mostly annoying and a bit of a mystery. Eventually I just muffled the beeping with some clothing. A good eight plus hours into the trip the bilge alarm went off. The pump was not pumping and the bilge was full of water. Now, this was a bit of concern, but luckily by then we were in calmer seas and Greg was able to bail the accumulated 10 gallons of water by hand. Once we dropped the anchor in Eleuthera, we discovered the rest of the broken things. We hadnâ€™t eaten much that day and I was ready for a hot meal. I switched on the solenoid and lit the stove, but there was no gas. The solenoid, the little switch that controls the flow of gas from the propane tank, wasnâ€™t working. No solenoid, no hot food. In the process of trying to diagnose the solenoid problem we discovered that the refrigerator was no longer working either. When you are out on the water being propelled by the wind and the trim of your sails you start to feel in tune with the elements. Your needs seem simple and organic as you traverse the seas heading to faraway destinations. You feel really free, out in the wild, off the grid. Then something breaks. And you are in the middle of nowhere. There is no repairperson to call. You worry whether you can diagnose the problem or have the parts to fix it or whether you can make it back to the grid, to the next port where there might be help or parts, but probably wonâ€™t because there is not West Marine in the middle of nowhere. You start to think about whether you can make do without refrigeration, a working stove, a bilge pump or what you can do to limp by. You wonder what the deal breaker is, when will you have to turn back, head for the dirt in the west with the big stores and innumerable parts and specialized repair people. The freedom you felt on your journey all becomes an illusion. You are only as free as the strength and health of your modern conveniences. Luckily for us, we found the problem. A battery connection had gotten wet and was corroded. We dried it off the best we could and let it sit over night. The next day had our fridge, stove and bilge pump back. So our adventure continues with hot food and cold leftovers and a bilge pump to keep the salt water on the outside. 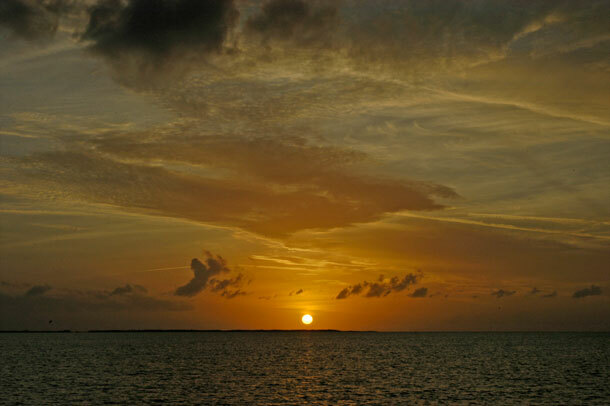 The sun sets on a long day and successful journey from Abaco to Eleuthera. This entry was posted in Eleuthera, Life on the Water, The Abacos, The Bahamas. Bookmark the permalink. Glad ya’ll are ok and got things working again. Hot food is a good thing! Miss you this holiday season…we at least saw you coming or going on your way to Charlotte. Hiking tomorrow morning with Lucia, as I do every Thursday but David is off all week and will go with us tomorrow. Not much else new. We are so dull! But, we are happy and healthy and I love being retired. David isn’t too far behind me now…soon it will be his turn! I am glad your equipment is back and working, especially the bilge pump. I haven’t commented in awhile, but I wanted to let you know that I am still reading and love the updates. Happy New Year to you both!